A friend who works for the York Agricultural & Industrial Museum asked if I would make a spill plane for the museum to be used in an interactive demonstration. Sure, but what does it look like? I had seen one only once before, and briefly, so I checked online and found some great articles here, here, and here. 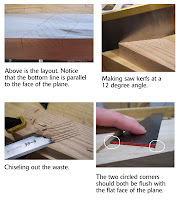 I used the one posted on the WK Fine Tools site for the layout & construction process. After 3 bungled attempts at not being able to cut the bed so the iron’s cutting edge protrudes from corner to corner at the same height on the wood surface of the plane, I finally decided it was time to ask dad for help. Dad = retired nuclear projects engineer, i.e., dude with some serious brainpower. Bracing myself for a dissertation on trigonomics, I handed him my mangled pieces of wood and a copy of the article and asked for his advice. A mere 10 minutes later (thank you, God) he determined that there was an angle missing from the article and that I could actually salvage my last attempt. Dad felt good about helping me solve the problem, but more importantly, I was able to remain in the dark where trig is concerned... and that's exactly where I want to be!